A ChromeBook is a small, lightweight and fast computer for people who need something more than a standard tablet, but don’t need everything that comes with a full-blown laptop. It’s for people who want to work on the move, or who need a computer that can use the Internet as well as basic office software but who don’t need to be able to install software from a CD. The problem is, ChromeBooks come with Google Docs as their standard document-editing facility. This means some compatibility is lost between ChromeBook users and users of other computers. Either you create a document in Google Docs and you share it with other Google Docs users, or you risk conversion problems when you send the document to someone else and they download it coverted to their own format. The solution is to bypass Google Docs and run a fully standards-compatible office program instead – but how do you do this on a system that is designed to not install normal software? 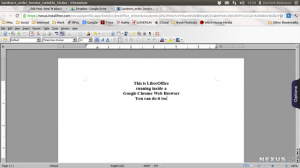 The key is to use a copy of LibreOffice that has been built to run inside the Google Chrome web browser. Search for “InstallFree Nexus with LibreOffice”. This is the LibreOffice software converted to run in Chrome. Click on the “Add to Chrome” button on the “InstallFree Nexus with LibreOffice” bar in the search results. LibreOffice will now install itself on your ChromeBook or into your Chrome browser. Follow the on-screen instructions to set up LibreOffice to work with your Google Docs and Google Drive accounts. This ensures that you can now use a fully-fledged office program for all your word processing, spreadsheet and other office document work. LibreOffice is a variant of OpenOffice, one of the most popular open source office programs around. It is fully compatible with Microsoft Office and can open all MS Office documents; including the new .docx format that is now gaining popularity. With LibreOffice installed on your ChromeBook, or into your Google Chrome browser, you can work with Google Docs and Google Drive just as you did before, but now you will be safe in the knowledge that what you produce can be seen by others in exactly the way you intended.